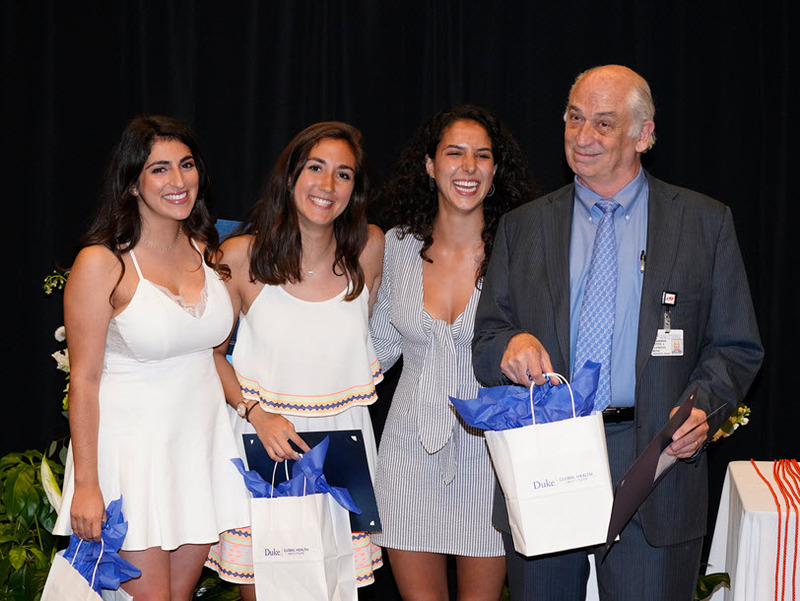 Each year, the Duke Global Health Institute honors outstanding students and faculty members with several awards. This year, we added a new award to the mix: the Michael Merson Undergraduate Student Leadership Award in Global Health, established to honor the legacy of founding DGHI director Michael Merson, who stepped down from his leadership role last year. Award recipients are listed below. Mary Story, professor and associate director for academic programs, presented the undergraduate awards. The Michael Merson Undergraduate Student Leadership Award in Global Health will be given each year—starting in 2018—to recognize a graduating global health undergraduate major student who has excelled in the classroom and in fieldwork and has demonstrated a strong commitment to global health and health equity through extracurricular activities and leadership. The inaugural award was given to Amanda Jankowski, a global health and sociology major who graduated with honors in sociology. Her thesis explored the influence of doctor comfort and acceptance on health care utilization for LGBTQ+ individuals, using data from the Social Justice Sexuality Project Survey 2010. While at Duke, Jankowski participated in the Penny Pilgram George Women’s Leadership Initiative Project, where she conducted qualitative interviews with female-identified students about health access and utilization, and was part of a Data+ team that worked with community partners to create small-area health maps of mortality data in Durham and Orange Counties. Jankowski also engaged in several service and leadership initiatives, including planning and leading an alternative Spring Break service experience focused on food security and homelessness. 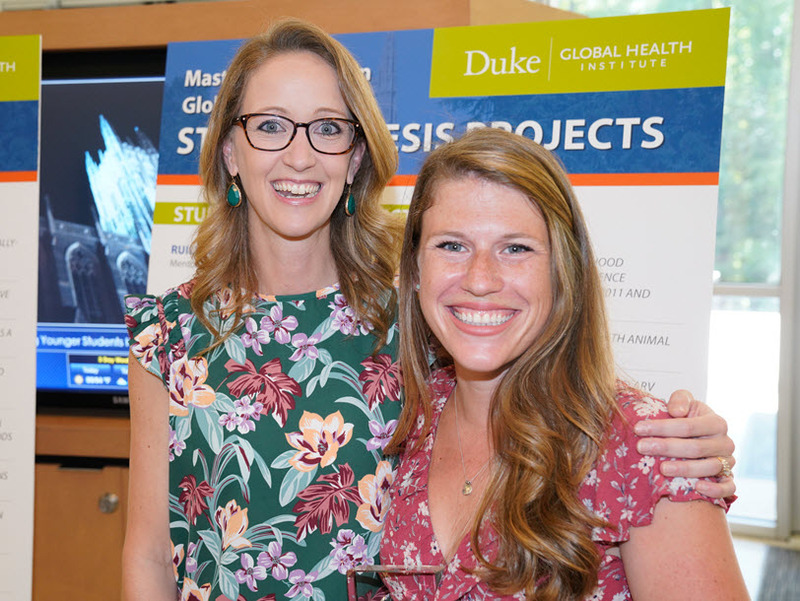 Through the capstone, the culminating experience for the Duke global health major, students execute a team-based project. Consulting with their professor, experts in the field and community members, they apply what they learned in their coursework and fieldwork to design a feasible solution to a real-world global health problem. This year’s winning team, who researched and developed a culinary skills training program to reduce recidivism among Durham’s formerly incarcerated population, included Emme Heneine, Anna Katz, Rachel Katz and Julia Kaufman. The students were part of a fall capstone class taught by Dennis Clements, professor of pediatrics, community and family medicine and global health. their professor Dennis Clements (far right). Photo by Jim Wallace. 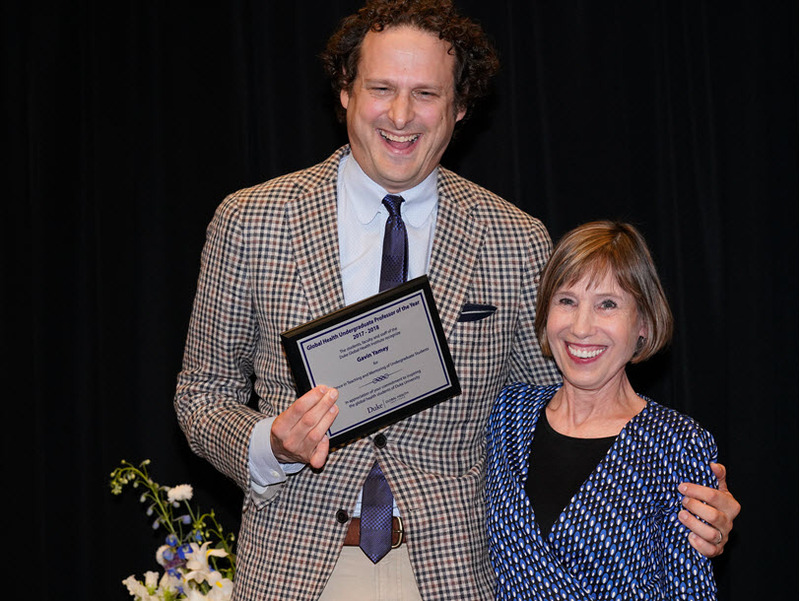 Gavin Yamey, professor of global health and public policy, was voted this year’s outstanding undergraduate professor based on student nominations. Professor Award from Mary Story. Photo by Jim Wallace. Watch the undergraduate award presentations. Nathan Thielman, professor and associate director of the Master of Science in Global Health program, presented the undergraduate awards. Tessa Concepcion received the outstanding graduate student of the year award, also called the “Madeline Boccuzzi Award” in remembrance of an exceptional Master of Science in Global Health (MSc-GH) graduate who received the award in 2013 and passed away in 2014 after a battle with cancer. The award is presented annually to a student who excels in the classroom and the field and builds community at Duke. For her thesis, investigated the burden of pediatric surgical disease in Somaliland. She was nominated for the award by one of her mentors, Emily Smith, assistant professor of epidemiology at Baylor University and adjunct DGHI faculty member—as well as three of her fieldwork partners from Somaliland. One of her nominators was Edna Adan Ismail, founder and director of the Edna Adan University Hospital. She noted, “Tessa was an exceptional volunteer who immersed herself into the study that she came to do right from the very first day.” Tessa’s other nominators described her as brilliant, motivated, hard-working and organized. Concepcion was also mentored by Henry Rice, professor of surgery and global Health. DGHI adjunct faculty member Emily Smith. Photo by Jim Wallace. 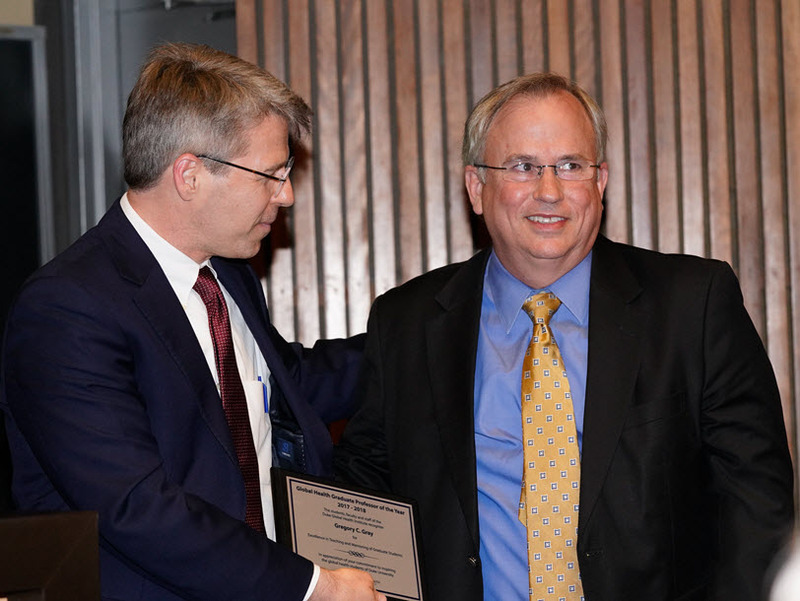 Gregory Gray, professor of medicine, global health and environmental health, was voted this year’s outstanding graduate professor based on student nominations. Award from Nathan Thielman. Photo by Jim Wallace. Watch the graduate award presentations. Amanda Jankowski, left, won the Michael Merson Undergraduate Student Leadership Award in Global Health,” established to honor the legacy of founding DGHI director Michael Merson (on right). Photo by Jim Wallace. Global health and sociology major Amanda Jankowski received the inaugural Michael Merson Undergraduate Student Leadership Award in Global Health.